Narrative therapy pays attention to how people make sense of their experiences and assists in changing their relationship with problems affecting their lives. This approach is guided by its philosophical foundations, interviewing practices and range of playful possibilities. In addition to guiding counseling conversations, these principles and ways of working offer tremendous possibilities in community, organizational and coaching contexts. LEARN MORE. We are a monthly online webinar when presenters and members from around the world meet together informally in real time. Our online courses offer stimulating content and practice applications with the option of gaining Continuing Education Credit. Several faculty now offer customized consultation opportunities that hone in on specific skill-development. We create rigorous and lively learning experiences where participants can further develop skills in narrative approaches in collaboration with others. Narrative Educators and Trainers are building a supportive network and a soon-to-be-available resource library. Our “meetings on a cloud” always occur at 5pm (New York time) on the third Sunday of the month, and each Salon we focus on a different theme with presenters from around the world. All of our courses draw from the best of teaching experiences and everyday practices with narrative practitioner-faculty. Four courses with Alliant CE Credit are now open for registration, with several others under construction. New content on our YouTube channel! We’re always adding new material to our public YouTube channel. See our playlists highlighting conversations with practitioners & teachers from around the world. Get glimpses of teacher’s presentations in our Online Courses. Be sure to click over and see what gems you can find! Find out about Our Non-profit Organization, the History of the Idea, our Narrative Luminaries, Ground Rules for Using the Internet in Productive and Socially Responsible Ways and and Our Global Commitments to honor unique features of local context and meanings. 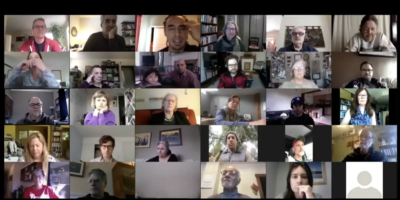 Get involved with our monthly webinar when online faculty and members from around the world meet together informally in real time for about an hour. Or watch the recording later in our growing library of Past Salons.